Record Players, We'll show the bright side of life!! Friday 2 november at Gebouw T, Bergen op Zoom, the Netherlands. 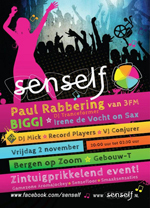 Senself with Paul Rabbering, BIGGI and the Record Players!!! Check website Gebouw T for more info and tickets! !